Taoist Training Universal Healing Tao UK | Welcome to Mantak Chia's System of Taoist Training with Universal Healing Tao UK – authentic training courses with experts! Birthdays come and birthdays go, but this one is quite unique. The coming weekend, Foundations Step1 on 24th and 25th November, and the following weekend of Healing Love on 1st and 2nd December, are the last I will be teaching. So come along, if you’ve been meaning to and even if you haven’t, to 3 Holmes Road, Kentish Town NW5 3AA from 10am to 4.30pm. £197 for one weekend, or £354.60 for the both. I’m looking forward to seeing you and to sharing these practices that have made such a huge difference to my life! Introduction to and preparation for the Microcosmic Orbit the foundation for the threefold path of Self-development, Healing, and Meditation. Awakening the universal (yang), earth (yin), and human-dimension (chi) energies develops and circulates increased life-force within your Self. The basic structures of Iron Shirt Chi Kung (QiGong) for rooting, centering and body-awareness. The effects are increased vitality, stamina, enhanced ability to fight disease and greater protection from injury, whether physical, emotional or spiritual. A look at some simple Tai Chi movements: whereas Chi Kung develops rooting and grounding, Tai Chi offers flexibility and adaptibility. Many students have learned to awaken the universal (yang), earth (yin), and human-dimension (chi) energies, to develop and circulate increased life-force. Develop a form of daily practice suitable for you, to integrate with your own personal life-situation. Step 1 Foundations Weekend is an ideal introduction for both women and men, singles and couples, young and old, and is a pre-requisite for Step 2 – Healing Love. 24th and 25th November, 10am to 4.30pm, @ 3 Holmes Road, Kentish Town, London NW5 3AA. £197 – or pay £354.60 to combine with Step 2 the following weekend. In this hands-on weekend you can learn enough to integrate the principles and techniques with your own practice, or simply spend an enjoyable weekend meeting new people, making new friends, and learning a highly effective and practical new skill you can use to help friends, family – and yourself! Yes, the CNT self-massage can show as many benefits as doing it on others. You don’t have to be ill to feel better! 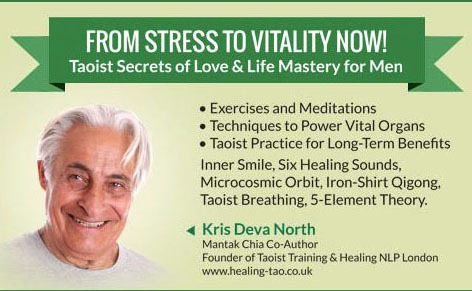 Your training is facilitated by myself, Kris Deva North, Mantak Chia co-author, Senior Teacher and Founder of the London Chi Nei Tsang Institute in 1992. 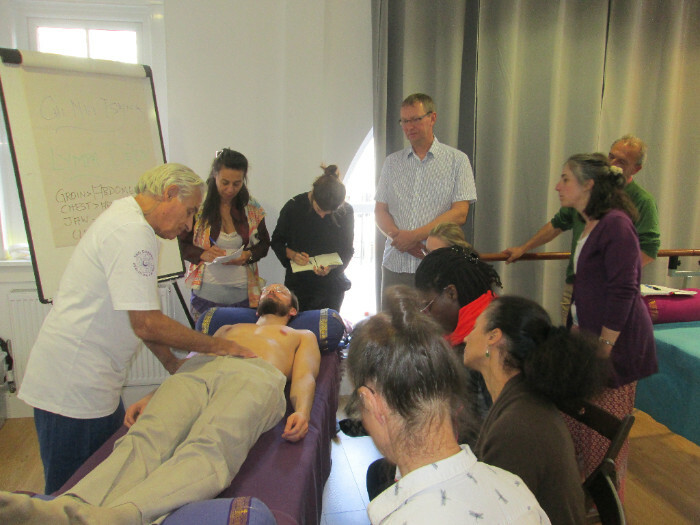 I have shared this wonderful therapy with people like you, Healers, Martial Artists, Health Professionals including nurses and midwives at the University of Greenwich School of Midwifery, and the Zita West Clinic. During my time at Tao Garden and on subsequent visits I was chosen to give CNT treatments to Mantak Chia and family. With Kris Deva North and Anamarta, Senior and Advanced Instructors of the Tai Chi Union for Great Britain. With combined experience of nearly 40 years between them and expertise in the Healing Tao Arts, which Tai Chi and Qigong are part of. 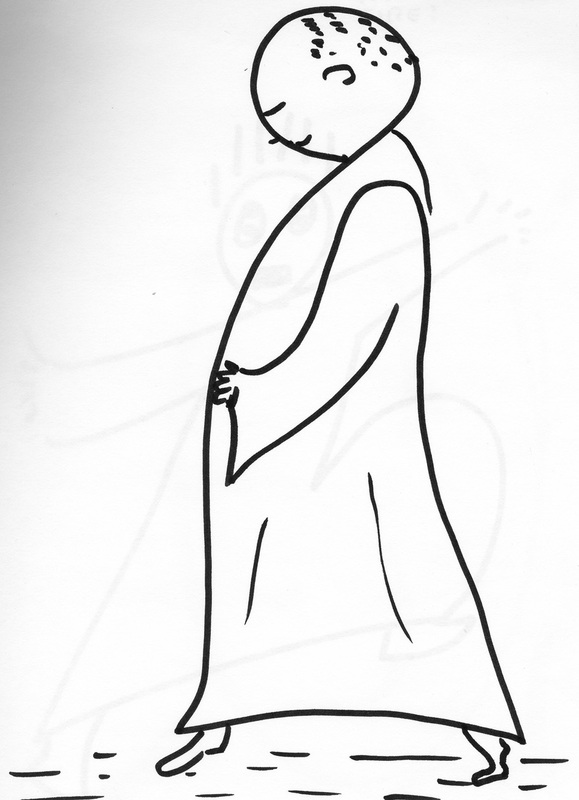 Taoists consider Tai Chi as one of the highest forms of Moving Meditation, harmonising Yang and Yin, and Qigong as Standing Meditation, for grounding and rooting. I don’t know if you have noticed that people who do Tai Chi seem to stand straighter yet more relaxed, move more easily with a kind of fluid grace? Have you wondered why, and how? Well, Tai Chi combines fitness, flexibility, and effective ways to manage stress while at the same time giving a fantastic energy boost! Now you can have this too when you come on by to combine Moving Meditations for Fitness + Flexibility, Build Confidence, Recapture Lost Energy, Turn Stress Into Vitality, Inner Strength for Inner Peace! 7 Tuesdays, 13 Movements, 9 Directions, 5 Elements, 3 Treasures, Yin and Yang, to become one of those Tai Chi practitioners people watch in the park, wishing they too could learn the slow, graceful form, and win the benefits! ALL WELCOME: Men, Women, Beginners, Intermediate, Advanced. Psychosynthesis Trust, 92-94 Tooley Street, London Bridge SE1 2TH – 2nd Floor, Room 23. 7pm to 8.30pm, £87 per 7-week Course, or £17 pay-as-you-go. 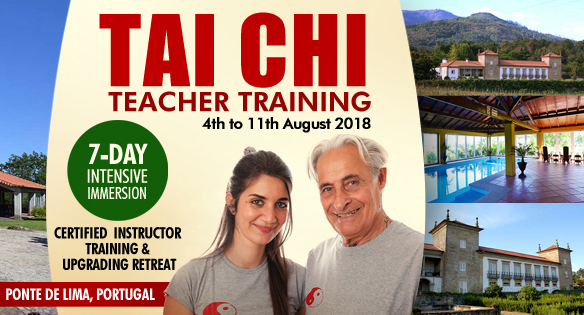 Tai Chi Teacher Training 2018! 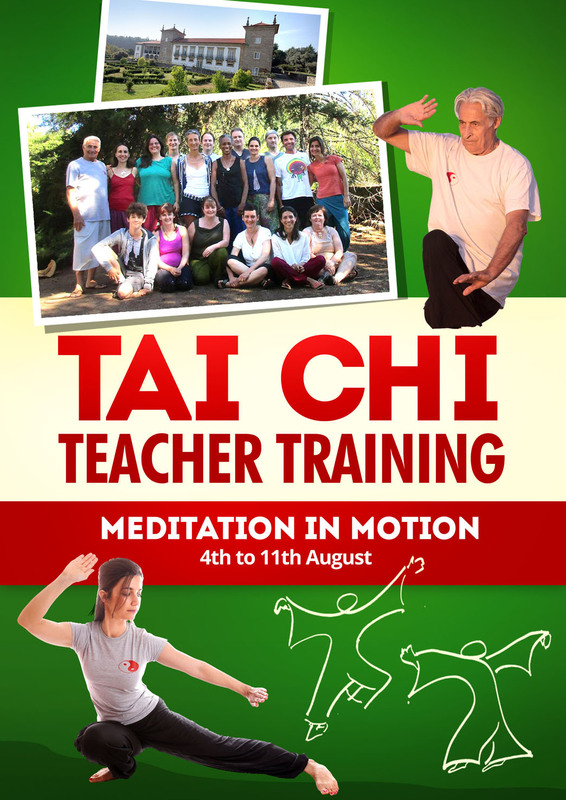 Have you thought about what it would be like to become a fully accredited Tai Chi Teacher? Or thought about what you can still do to get in the way of Tai Chi without doing the hard bits? With just over a month to go, we’re closing down the enrolments! One week, 4th to 11th August, expenses paid – except your flight – and full coverage of everything you need to know. Go to this link to read all about it, and scroll down to pay your deposit. We, Anamarta and I, look forward to seeing you! You don’t need to know Tai Chi, just be enthusiastic about it! How much training have you done? It doesn’t matter! You can learn the basics and take them away with you. You can, with a little bit of background, learn how to defend yourself! You can, with a satisfactory level of learning, become a Tai Chi Instructor! Officially! On the register of the Tai Chi Union for Great Britain. Check out what you need to know. Check out what you need to bring. Check out if you are planning a holiday. And then, find out about joining us! Go ahead, look at the basic information, and then join us! You won’t regret it – in fact, it might just be the turning point in your life!